After eight years, Spare Bricks says goodbye. Spare Bricks started in 1999 as an idea by Rick Karhu, and our little webzine became more successful and more exciting than any of us had imagined. But all good things must come to an end, and for Spare Bricks, the end has come. We did not originally intend for this to be our last issue. But Pink Floyd is essentially defunct, and it is hard to stir up enough excitement over a couple of sparse 'greatest hits' tours and a four-song reunion to keep us going. Maybe if Pink Floyd puts out an album of new music we'll be back. It gives us something to look forward to, but as much as I would love to see it happen, I fear it never will. Richard Wright's 1996 suggestion that the band was working in six- or seven-year cycles was overly optimistic. It has been nearly 14 years since The Division Bell, and it seems to me that if Pink Floyd wanted to be Pink Floyd, they would find a way to do it. I suspect that David Gilmour would rather be 'the voice and guitar of Pink Floyd' than assume the weighty mantle of Pink himself one more time. I would like to thank each of our dedicated, creative staff members through the years for all of their hard work: Lewis Anthony, Dave Baker, Russ Blomstedt, Bob Cooney, Brian "_pink" Davis, Jacki Dimitroff, Sean Ellis, Mike Feeney, Ron Fleischer, Tommy Gatton, Dean Hebert, Mark Henne, Chris Hogan, Gerhard den Hollander, Dennis Howie, Christopher Hughes, Ryan D. Kearns, Patrick Keller, Felipe "Maglor" Jensen, Richard Mahon, David Marshall, Mike McCartney, Jeff McFadden, Ed Paule, Joe Penczak, Mark Reed, Jeff Scott, Terry Shea, Andre Terhorst, Thanasis Tsilderikis, Johnny Valenzuela, Phillipe van Roy, Dan Verbin, Dave Ward, Elisa Ward, John Waters, Daria Wells, McDaniel Wyatt, and Sean Zloch. I would also like to thank the many guest contributors who have written for us from time to time: Mark Brown, Dante Corricello, Rowan D'Albert, Sonya Delisle, Vernon Fitch, Scott Frank, Rachel Funari, Mark Jacoby, JCE, David King, Philippe Legault, Johan Lif, John McIntyre, Davide Romboli, John Roscoe, Ian Priston, Elliot Tayman, Colin Turner, Denise Vacca, and Gaetano Villari. Special thanks go to Rick Karhu, the founder and publisher of Spare Bricks, without whom none of this would have been possible, and to Joakim Nordlander, our gracious web host for the last several years. And most of all I would like to thank you, our faithful readers, for sticking with us all these years. Mike McInnis is the editor of Spare Bricks. This issue of Spare Bricks features what is probably our most innovative theme of all: a look at Pink Floyd through an academic lens. We pick apart Pink Floyd's legacy from the perspective of a number of different school subjects, from Chemistry and Physics to Philosophy and Literature. We turned Bob Cooney's regular 'Top Ten' column into an Honor Roll of Pink Floyd's best songs (strangely appropriate for our final issue), and our regular trivia quiz (the only column to run in all 32 issues of Spare Bricks) into a Final Exam. 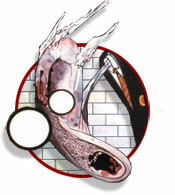 So join us as we go Back to School with Pink Floyd. Professor Ellis discusses Waters' use of Didactic Poetry and Catalog Verse. Professor Gatton studies the history of Pink Floyd as displayed at a 2006 Roger Waters concert. An honor roll of the Floyd's best work.